Faulkner 48469 Standard Recliner Black Padded with Padded Arms PICTURE, Avi Depot=Much More Value For Your Money! Faulkner Recliners have unsurpassed ergonomic design. Both aesthetically pleasing and comfortable, Faulkner offers the ultimate lounging experience. Durable poly/cotton fabric lasts and stays soft to the touch. Padded armrests and a high density foam pillow add to the comfort. Faulkner Padded Recliners are lightweight at 27lbs, but also incredibly strong with a 350lb weight allowance. 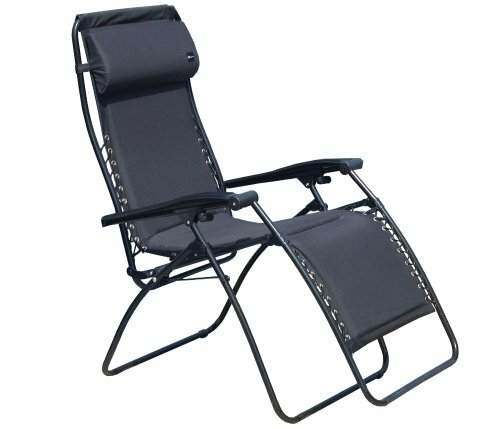 Faulkner Recliners also feature the zero gravity position to allow you to achieve superior relaxation. This position is reach when the legs are elevated above the heart, increasing your circulation and decreasing stress on your spine. A lock allows you to stay in this position, or any angle from the upright position. Fully accessorize your recliner with these items also available on Amazon: Black or white serving tray, carry bag, pocket pouch, replacement lacing, and recliner towels.